RealTrader is a trading management tool for experienced traders and a great investment in your professionalism. With the RealTrader panel, you always have the right to be wrong thanks to convenient management of multiple deals. Simply move one line on the chart, and Take Profit of all appropriate deals will be set on a desired level immediately, so that you can always know your potential profit on the level throughout the entire amount of deals. Also, the special field allows you to set a desired profit in the deposit currency or percentage of the deposit. RealTrader will immediately set Take Profit for open unidirectional deals at the necessary level. Drawing custom lines on the chart is an excellent tool of technical analysis, while ability to trade from the lines makes RealTrader an indispensable trading assistant. Analyze the market, select the deal type, draw a line of any length and angle (you can plot a channel or any pattern out of the selected Buy and Sell lines), and when the price touches the line, a new deal is opened with a necessary volume and specified Take Profit and Stop Loss. If necessary, RealTrader trails your profit. Experienced traders often use pivot, support and resistance levels, as well as so-called psychological (round) levels. The appropriate indicators are built into RealTrader for the maximum efficiency and user convenience. They can be enabled/disabled via the panel buttons. The panel also features a convenient indicator for separating days. 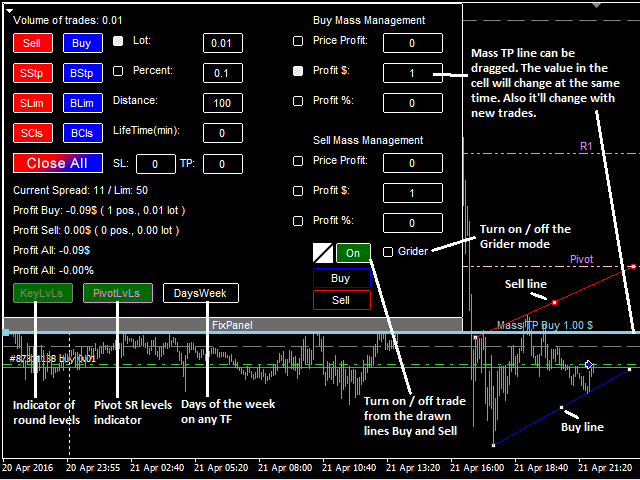 All main trading parameters are managed directly on the chart. Simplicity, speed, and accuracy of the trading management process are the key advantages of the panel. It also facilitates convenient multicurrency trading. Profit % - set the necessary % of profit, so that RealTrader calculates TP for all unidirectional deals. Step of Trailing (0-Off) - trailing stop step. Setup Grider Levels - grid manager setting. There are five levels for maintaining pending orders, which can be adjusted at will. When the 'Grider' checkbox is active on the panel, every trade opened by the panel is maintained by the pending orders set here. The maintaining pending orders can be any for any direction. Directions operate independently. Since the panel is semi-automated, testing in visual mode only is recommended. Lines cannot be plotted in the tester. If you have any improvement suggestions, please contact me via personal messages. Fantastic trade manager for the opening and closing of orders efficiently and accurately. Use of trend lines is innovative and works very well, the mass TP line is brilliant. Built in breakeven/trailing features are very useful and save time. Most of all Evgeny's support is second to none as well as having one of the best EA's on the market (BoM) in my opinion. Added the 'Grider' mode. When the 'Grider' checkbox is active on the panel, every trade opened by the panel is maintained by the pending orders set in the input parameters. The maintaining pending orders can be any for any direction. Directions operate independently. Now, if the pending orders opened by the panel are triggered, the 'Mass TP' line is moved, accordingly modifying TP of all trades of the same direction.